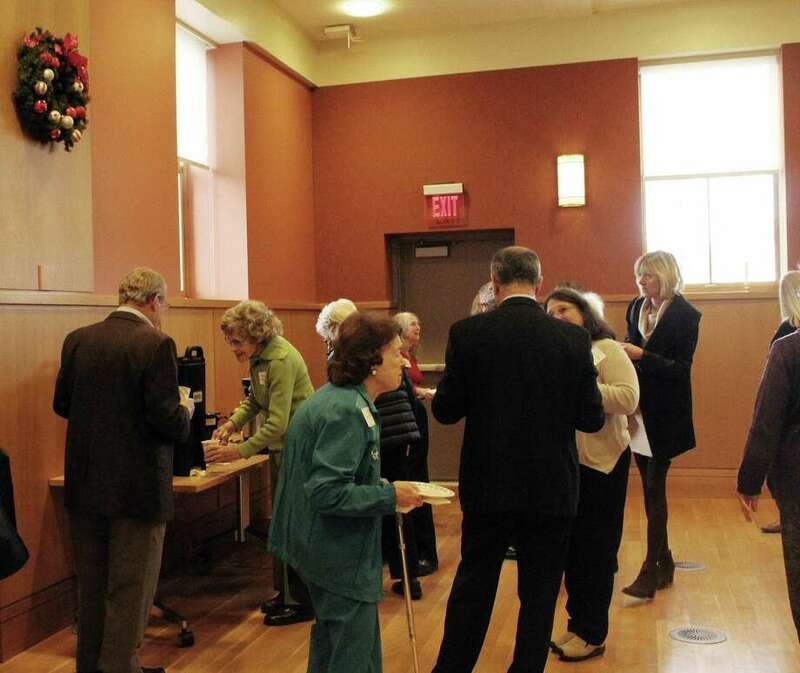 Seniors of Darien mingled before the annual meeting of At Home in Darien at the Darien Library in Darien, CT on Dec. 6, 2016. DARIEN — Ninety percent of the population wants to stay in their home as long as possible as they age. Sometimes this is difficult due to health and financial constraints, but organizations like At Home In Darien are working together with the community and making it possible for aging residents of Darien to stay in the town many have called home for decades. On Dec. 6, At Home In Darien held their annual meeting in the community room of the Darien Library where special guest speaker Christianne Kovel of the Connecticut Commission on Women, Children and Seniors came to discuss the future of aging at home in Connecticut. As a policy analyst for the Connecticut Commission on Women, Children and Seniors, Kovel, who has worked in aging services her entire life, analyzes the consequences for seniors of any new legislation. This could mean looking at anything from a bill on senior nutrition or a bill on farmer’s market coupon for the elderly. For more information about At Home In Darien, visit its updated website at athomeindarien.org. Anyone over the age of 60 living in town also gets a free At Home In Darien membership card which offers them discounts and incentives around town. This sort of senior-friendly legislation is becoming increasingly important as the population ages. According to Kovel, Connecticut is the seventh oldest state in the country and by 2025, a majority of the towns in the state will have a population that is at least 20 percent people aged 65 or older including Darien. “The whole nation is aging, especially New England,” Kovel said. In 2012, the Connecticut General Assembly formed an Aging in Place Task Force to study issues related to aging in place initiatives. In the upcoming year, there will be discussions about zoning changes to allow temporary healthcare structures in backyards. Known as “granny pods,” these homes allow for elderly family members to live in close proximity to their relatives for health reasons, but also maintain a sense of independence in a small space. There will also be discussion about expansion on home medical care options, something which First Selectman Stevenson expressed interest in expanding in Darien. While this legislation will affect seniors throughout Connecticut, At Home In Darien is looking forward to continuing to expand their own services throughout seniors in town. “My needs are relatively met,” the Darien resident of 47 years added. Wyn Lydecker, a founding member of At Home In Darien and a departing board member, said she’s pleased with how the group continues to work with the community to help seniors since it began ten years ago.